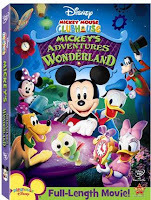 Today, Playhouse Disney's Mickey Mouse Clubhouse's new full-length movie Mickey's Adventures in Wonderland hits the stores. We are already huge fans of the Mickey Mouse Clubhouse animated series, so I just knew that my children would love this movie, but I actually underestimated how much. In a 48 hour period, my children asked to watch this DVD three times. Luckily, the movie is only 50 minutes in length, which is a perfect length for younger children. The adventure began as the cuckoo bird escaped from the clock, which was to be Daisy's surprise birthday gift. Even though this DVD was in a movie format, it still possessed the same features which I love about the show as a parent, which are asking the audience to participate and encouraging logical thinking and problem solving. 1) My son's favorite character, aside from Mickey and Donald, was the cuckoo bird. 2) His favorite part of wonderland was Upside Down Land. 3) Jake's favorite part of the movie was when Mickey and Donald became lost. 4) Of course, everybody loves the Hot Dog Song at the end of the movie. You can find Mickey's Adventures in Wonderland on DVD locally and online at the Disney Store and at most major retailers of children's DVDs. Thank you to WDFHE for providing us with a review product free of charge.